NHL News : Stamkos throws a sucker punch at the end of Game 3, puts a giant target on his back. Stamkos throws a sucker punch at the end of Game 3, puts a giant target on his back. He's going to regret this one. The Columbus Blue Jackets have shocked the world in their first round playoff series against the Tampa Bay Lightning in the 2019 Stanley Cup Playoffs, and perhaps more importantly they have shocked the Tampa Bay Lightning. We are now 3 games into a series that every single odds maker had the Lightning listed as heavy, heavy, favorites for and the Lightning find themselves without a single way and facing down 4 consecutive elimination games. It has the makings of what could legitimately the greatest upset in the history of the Stanley Cup Playoffs and if the Blue Jackets can complete the sweep I would rank it as just that. The Lightning will need to find their way and in a hurry if they want any chance of getting back into this one, but their captain may have made that task even more difficult for them. The Blue Jackets dominated the Lightning, who admittedly were missing both forward Nikita Kucherov and defenseman Victor Hedman arguably their top players at those respective positions, on Sunday eventually triumphing 3 - 1 by the time it was all said and done. It's true that the Blue Jackets needed some big saves from goaltender Sergei Bobrovsky this time around, but the Blue Jackets never relinquished their lead and kept their foot on the gas for the full 60 minutes to hand the Lightning a 3rd straight loss for the first time all season. The Blue Jackets seem pretty motivated to take this series and are likely brimming with confidence at this point after slapping around one of the best teams in regular season history for the first 3 games. 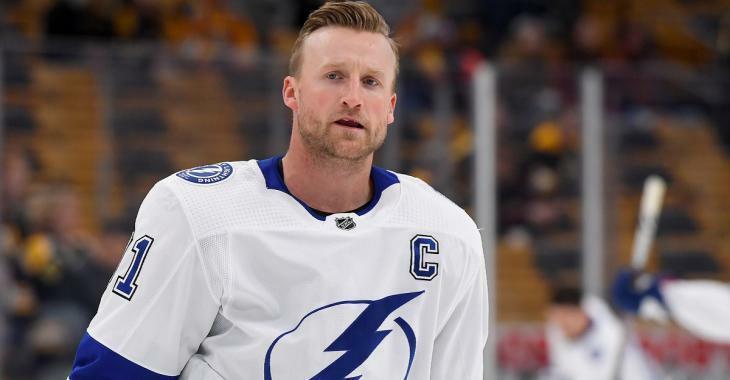 Keeping that in mind, the last thing you should want to do is give the Blue Jackets more motivation for Game 4, but that is exactly what Lightning captain Steven Stamkos did in the final minutes of Game 3. In the final seconds of the game a scrum ensued between both teams and Stamkos took the opportunity to throw a blatant sucker punch at Columbus Blue Jackets captain Nick Foligno. The problem of course is that Foligno is one of the toughest customers in the National Hockey League and it took multiple people to prevent him from tearing Stamkos' head off once he realized who had dinged him with the sucker punch. Not only is this the equivalent of poking an angry bear, but it has also undoubtedly put a giant target on the back of Steven Stamkos in Game 4, something that Foligno all but acknowledged in his post game interview. When asked about the sucker punch Foligno was quick to express his disappointment in Stamkos, but also made it clear that the next time around he would dishing out some payback. "I’d just like to think he has a little more respect, but it’s playoff hockey too," said Foligno acknowledging that things can get a little rougher this time of year. "I can’t expect it not to happen in a scrum. Next time I’ll just make sure to throw the first punch." If I am Steven Stmakos I am not looking forward to Game 4, in more ways than one.